If you like to plan an event, run a conference, you may need to consider a lot of details. First you think about what type of conference you’d like to have. It can be small like a meeting for a dinner with a few locals. A bit bigger maybe with a presentation before the dinner. Or you like to run a full conference with one or two days, you may need a lot of presentations over the day with lunch and maybe some dinner. For two days or more, it’s always nice to have a bigger evening event in-between. For planning, you best have a few people who like to have that event and want to help on planning. In order to find a date, you best ask yourself where you have time and than when others have time. Also check if you like to have some well known speakers from other countries to join you. For a few conferences I did make a spreadsheet here to check which weeks people have time. In some countries, there may be school holidays, so people prefer to spend time with family and not attend your conference. Other countries may have an holiday and you won’t get many US people if you pick Thanksgiving week. So if you have a week and maybe a day where a few key people are available, you can check for a location. We had small meetings, where we just reserved a table in a restaurant and met together. If you like to do presentation, you may want to look for restaurants which can provide a room for family parties. This way you have a separate room without paying for it. And those extra rooms may be available in the week if there is no one having a birthday party there. For a bigger conference I do prefer to pick a nice hotel as people from farer away may want to book a room in the same hotel. Picking a hotel can be difficult. For your event in London, we picked a hotel not in the city center of London as those are quite expensive. But we picked one more outside in Wimbledon, where you can simply get to city center via subway for your sight seeing tour. 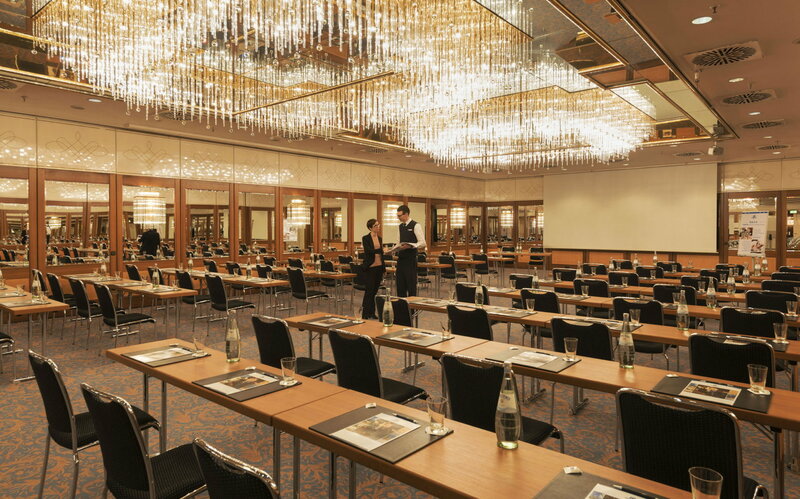 For the Xojo conference in Munich, I looked into several hotels and eventually decided for the Maritim hotel. The hotel is big enough that they can easily block 50 rooms. It’s located near the main station, so you can walk there when you arrive there by train. From the airport you can get in 40 minutes to the main station. Next to the hotel are other hotels with cheaper prices for attendees on a tight budget. In general we prefer smaller hotels, which we can take over, so anyone in the bar is probably a developer. If you remember the conferences big hotels like the ones in Las Vegas, you hardly met anyone when you left the conference area. For a smaller hotel, it may be good to ask them which week is not busy as they may give you more favorable terms if you help them filling the empty space. Once you got a date and a location, you should immediately announce the event. Don't wait for a schedule or what content you show. The date must be announced as early as possible, so people can plan their vacation and make sure they block time in the calendar. Best time for such an announcement is of course the last event. That is the reason we announced the Munich conference in Berlin and Xojo Inc. announced the conference for Miami right in Denver. To announce, you can tell your friends about the event, post something on the forum and send announcement emails to pr@xojo.com and pr@xdevmag.com to let them post it. Also we can put the event on the list for MBS website as well as Xojo Inc. may list it in their newsletters. For pricing the conference, well you may not want to add a lot of money yourself, but you are at risk to pay the hotel for cancelling. Usually you should reserve space for a good conference, but allow to reduce or cancel at some date. That is the reason, we had early bird offers to get people to sign up 6 months in advance for the Munich conference. For us the cancel date was 6 months before the conference, so at that people we could decide to cancel the whole thing if we didn't get a minimum of people to join. And for the minimum you need, you calculate prices which make it work for a minimum conference. And with minimum I mean a minimum like just rooms and projector. When more people sign-up, there is money for nice things like lunch, coffee or a dinner. So for Munich, we reserved two rooms in case we would go with two tracks. We blocked 100 rooms and started to offer tickets at lowest possible prices. Luckily a few people signed up early, so in March, we made decision to run the conference. But at that point it was clear that we would certainly not need the second room and we reduced to one conference room. Later we came well over 50 attendees, reaching 60 signups on the end. So we served lunch with beverages, snacks and coffee in-between sessions, got faster Wifi and added dinner events for the whole group. We even decided to just include the after-conference dinner as some money was left in the budget. But that is not guaranteed. The offer for a training day is a good way to make extra money. As being an advanced Xojo developer, I made training days several time already. The financial success of a full feature conference can vary a lot. We had conferences where we made a profit and others where we made a deficit. If the training works well, it can fund the deficit or at least pay my own ticket or hotel rooms as trainer. Any volunteers to organize something for fall 2019? It doesn't need to be me doing all the heavy work.